Newly crowned Miss Guyana Universe 2016 Nuriyyih Gerrard flanked by the runners-up and the other contestants. 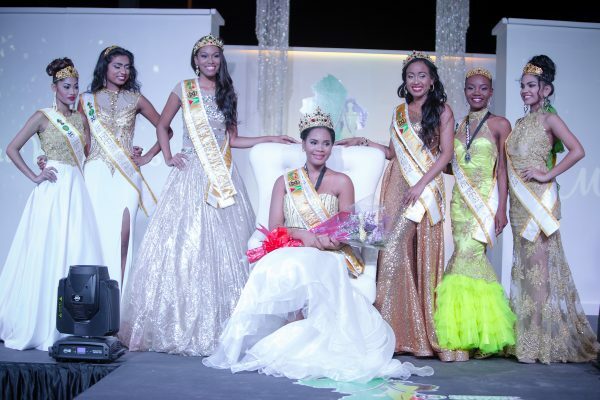 Local actress and radio personality Nuriyyih Gerrard was on Friday night crowned Miss Guyana World 2016 as the local leg of the annual pageant concluded with a simple coronation ceremony at Parc Rayne. 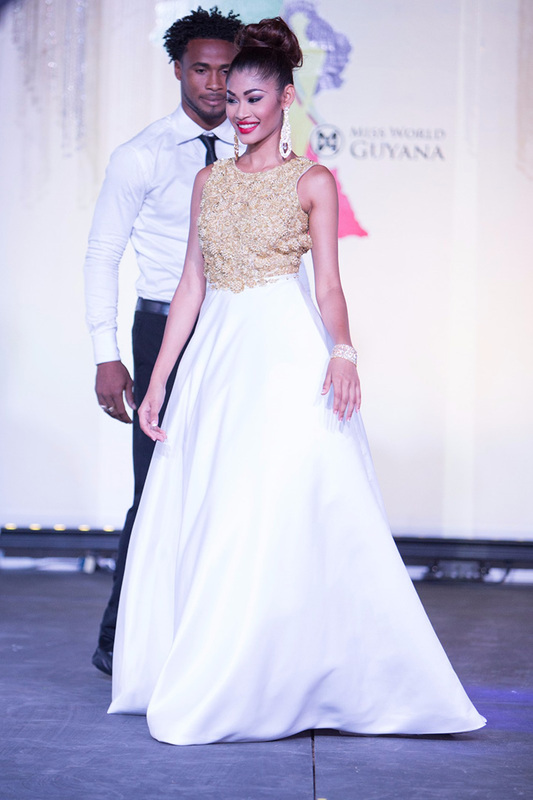 While she is widely known for her vibrant personality on the ‘Jump Start’ show, a local morning radio programme which she co-hosts with Gordon Moseley, Gerrard proved to a panel of judges that she also has what it takes to walk away with the coveted title of Miss Guyana World 2016 as she beat out six other contestants in her successful quest for the crown. Friday evening’s coronation began with individual dance pieces performed by the seven contestants followed by the winners of the talent segment—Treasure James, Najuma Nelson and Gerrard—performing. However, the most anticipated segment of the night had to be the evening gown competition, as the otherwise quiet audience came alive with cheers for their favourites as they took the stage. Perhaps in keeping with the celebration of Guyana’s Golden Jubilee, most, if not all the contestants’ gowns portrayed a ‘golden’ theme. One of the audience’s favourites Diyva Yabindranauth during the evening gown segment. Winner of the best interview segment and second runner-up Najuma Nelson being escorted onto the stage by a member of the Golden Jaguars Football team. 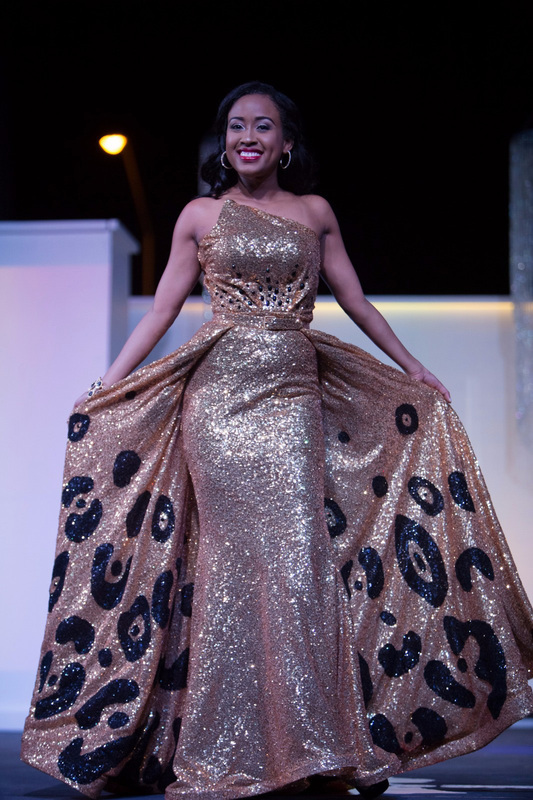 First runner-up and winner of the evening gown segment Treasure James showcasing her ‘Golden Jaguar’ evening gown at Friday’s pageant. The princesses surrounded their new queen just after Nuriyyih Gerrard was announced as this year’s winner. Among the crowd favorites were Diyva Yabindranauth, Nelson, James and Gerrard. But like every other segment in the pageant there could have been only one winner; in this case it was James who sent the audience into a frenzy when she took the stage in a gown that was said to present the rich minerals in Region 7 for which she was the ambassador. The golden gown hugged her body and shimmered in the light as she gracefully manoeuvred across the stage. And as if that was not enough, James pulled back the skirt of the dress to reveal a part of the gown designed to represent Guyana’s national animal – the jaguar. Coming down to the end of the evening, it was Nelson, James and Gerrard who advanced to the finals much to the audience’s pleasure. Up to that point, many would have argued that the competition was stiff among the top three as the cheers emanating from the audience seemed equally spilt for them. However, it was Gerrard, without a doubt, who won over the audience with her response to the final question as her answer created an uproar. It was not long after, that the scores were tallied and the results announced. 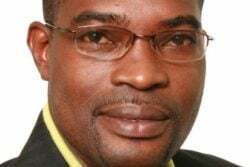 Nelson was named second runner-up, followed by James as first runner-up and Gerrard was announced as this year’s Miss Guyana World. Upon hearing the results, a seemingly shocked Gerrard struggled to fight back tears as the other delegates embraced her in a moment of comfort before she was officially crowned by her predecessor Lisa Punch. 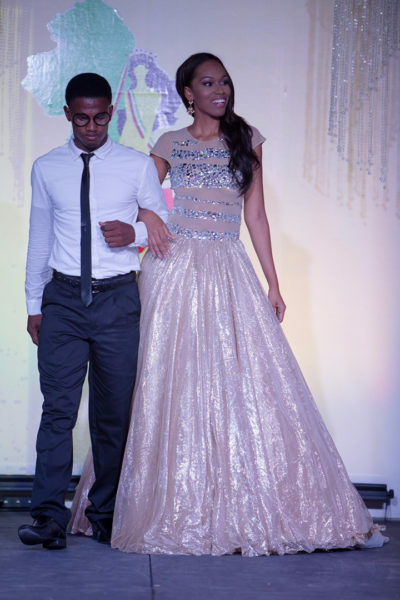 Gerrard also copped the top prize in the talent segment, while other special prizes were awarded as follows: Beauty with a Purpose Winner – Marva Langevine, Sports and Fitness Winner – Ariella Basdeo, Best Interview – Nelson and Top Model – Ashmini Ramnauth. Divya Yabindranauth took three awards: the Multimedia, Photogenic and People’s Choice. 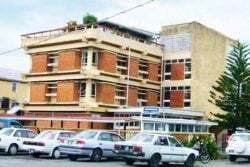 Gerrard will represent Guyana at the international leg of the Miss World Pageant at a date and venue that are yet to be announced. Last year, Punch who was Guyana’s representative at the Miss World Pageant, managed to secure a spot in Top 10 and was also the winner of Talent Round during the pageant which was held in Sanya, China. But it was Miss Guyana World 2014 Rafieya Hussain, who brought Guyana back to the forefront of the international competition when she made it into the Top 10 and was named one of five Beauty With a Purpose winners.